THE best business owners and operators from Gladstone have been celebrated for their services at The Observer Westpac Best in Business Awards. 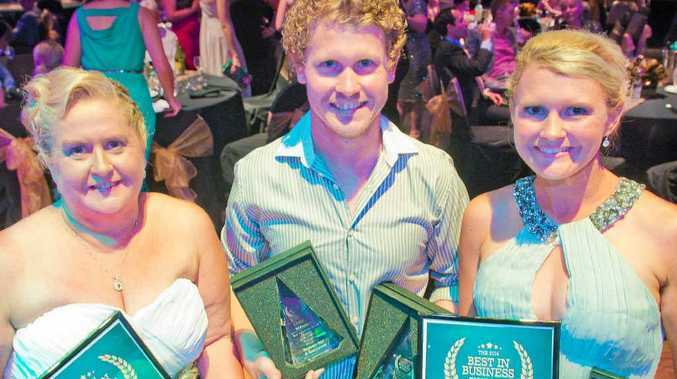 More than 370 people from a broad category of businesses filled the Gladstone Entertainment Convention Centre, hoping they would take out a prestigious award. Supported by the Gladstone Chamber of Commerce and Industry, the awards recognised businesses going the extra mile for their customers. Rocks@lt Bar and Restaurant won the overall award and were crowned Best in Business. Owner Jason Faint was working when the award was announced but arrived soon after. Mr Faint said he hadn't expected to win the award. "I'm really blown away that we won," he said. "I have to thank my mum because she is the backbone to my restaurant." Mr Faint's mum Mary Urquhart was up on stage three times to receive awards including the Best in Service award for her work at Rocks@lt.
Mrs Urquhart said she was happy to finally win. "This feels great because I have been nominated the last couple of years and haven't won," she said. "I'm finally not a bridesmaid. We try to do our best. Sometimes you can't satisfy everyone but we try our best." To make the night more special for Mrs Urquhart, her daughter Kellie Bebendorf won finance and banking category. The family left the special night with four awards between the three of them.